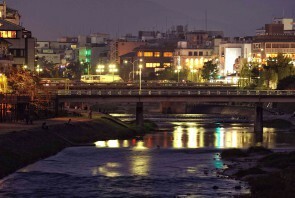 The city of Kyoto. Here at Aoi Kyoto Stay, we are convinced that there is no place else in this world that is so full of wonders, charm and fascination than the former capital city of Japan. It seems like no matter how often you come to visit, there are always new discoveries to make and more beautiful and graceful facets to uncover. In accordance with the city’s ever-changing sceneries, we want to share with our guests new and different forms of traveling. It was with this philosophy in mind that first Aoi Kyoto Stay (Machiya-Stay) and later Aoi Hotel Kyoto were founded. Once again, it was the same thought and desire that lead to the creation of our new hotel brand, Aoi Hotel Kyoto Premium. With only 5 spacious rooms in total, Aoi Hotel Kyoto Premium almost represents a kind of personal sanctuary from the busy everyday life of Kyoto. Even though it is located right in the heart of the city, its modern yet simple and modest design provides it with a calming and soothing atmosphere. It is the delicate blend of a feeling-at-home warmth of a traditional Japanese Machiya and the convenience and comfort of a hotel that leaves no doubt that nowhere else in Kyoto you will be able to spend this kind of quality time to your heart’s content. 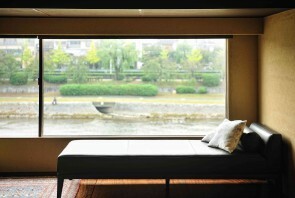 In the river-view rooms, you can let your worries fade away by taking in the breathtaking scenery of Kamogawa River and Higashiyama Mountain from your private special seat beside the large windows. In the city-view room, you can spend time your very own way by taking in its refined and calming atmosphere, savoring the fine art of the folding screen paintings inside, or by taking a short breather at the shared space terrace located on the hotel’s rooftop. ●Hotel design by SUPPOSE DESIGN OFFICE Co,.Ltd. 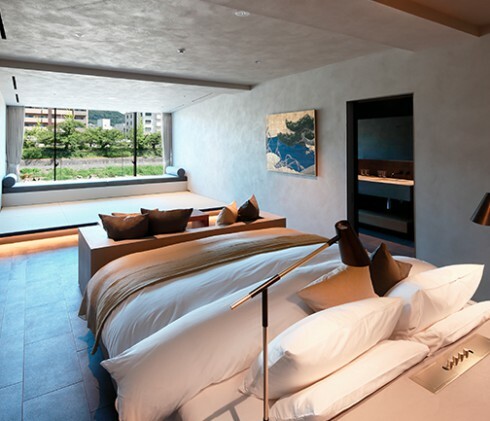 Aoi Hotel Kyoto Premium was designed by the multi-award winning SUPPOSE DESIGN OFFICE. The Hiroshima based studio has gathered popularity, highly critical acclaim and many prizes both in- and outside of Japan and is considered one of its fastest growing and most exciting architecture firms. Based on typical architectural features of traditional Kyo-Machiya town houses, such as the kitchen at the entrance, the raised tatami and living area, as well as its length-orientated layout, the rooms are specifically designed to remind you of the historical accommodations in Kyoto. 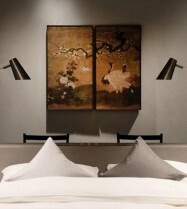 Perhaps this is the main reason why underneath the modern and stylish design of the rooms, one is still able to feel the calming, reassuring and comforting warmth of a Japanese home. Even though Kyoto is known for its particularly hot summers since old times, the unusually fierce heat wave that has been hitting Japan this year even took Kyoto locals by surprise. While the hot and humid days continue, we have created the following short guide to spending summer time in Kyoto, so that our guests will not be defeated by this heat wave and can get the most out of their stay. Even though at first this might sound like a plan that is hard to pull through, this can definitely be a rewarding and wonderful experience. Waking up early and going on a sightseeing tour outside of the usual hours will not only save you from the high temperatures and burning sun, but will also allow you to experience places in a different and unique way. Places that are usually packed with people and tourists, such as the pathways and slopes to the famous Kiyomizu temple, will show you their true colors with only a few people scattered around. 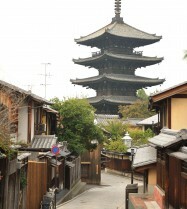 Even the Kiyomizu temple itself (which opens its gates at 6am) will feel as if you are having it all to yourself. 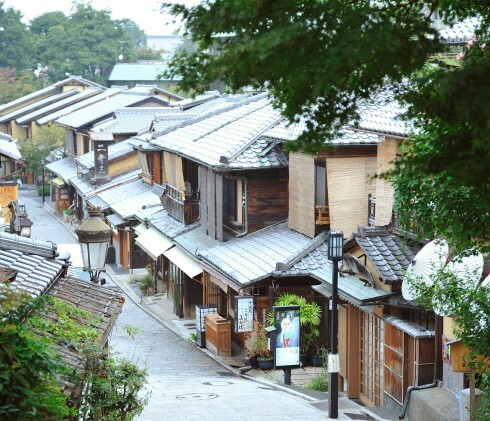 Enjoy the cool morning breeze while taking a stroll through Higashiyama district and see the classic beauty of Kyoto while it is about to wake up from its deep slumber. Guests staying at our Kangetsu-tei or Kan-un-an villa can enjoy the early morning hours by walking down the Philosopher’s Path or paying a visit to the famous Nanzenji temple close by. Once the calm early morning hours have passed and during the fierce heat and glaring sun of daytime, return and take a moment to relax inside of our Machiya or spacious hotel rooms. 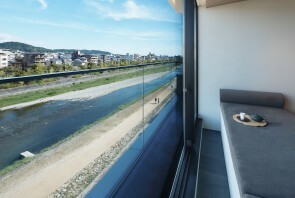 You can enjoy a cup of tea while looking at the Kamogawa river right in front of your window, pick up a book and read or even take a short nap. The possibilities of enjoying your house or room in your very own way are endless. You might also want to try going to a nearby spa or even have a professional massage in your room to help you relax and forget about the stress of everyday life. When the sun has set and the temperature drops, it is the perfect time to enjoy a special meal outside by the riverbanks. 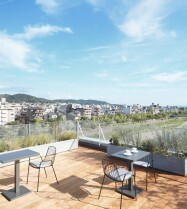 Kawayuka is the name of the wooden terraces which restaurants along the Kamogawa river build in April and open up for business from May to September only. Along Kiyamachi street and in close proximity to our hotel there is a variety of restaurants (starting from long-established Japanese restaurants to French and Italian restaurants and even bars) that offer you a seat at their kawayuka. Enjoying a delicious meal while sitting on the terrace and feeling the soft breeze on your skin with the calming sounds of the river in the background truly is the real definition of a summer night in Kyoto. 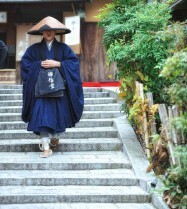 The kawayuka are a special feature of summer in Kyoto and an unforgettable experience you cannot make anywhere else. COPYRIGHT © AOI ALL RIGHT RESERVED.